I’m a big fan of physical UART/RS-232 ports on boards. So I was somewhat disappointed not to see a serial 9pin connector on the Freedom KL25Z board. But it is perfectly understood that for this price costs are critical, and a serial header or connector is pushing the budget for that board very likely out of the water. Still, I want serial connectivity for my applications. 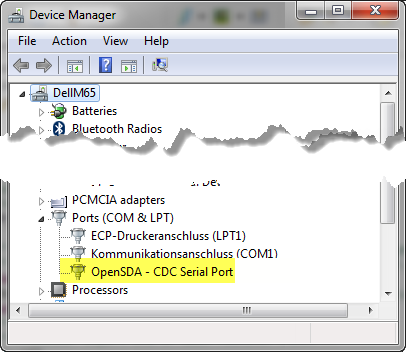 When I ported FreeRTOS to the Freedom board, I noticed that the OpenSDA debug interface enumerated as well a USB CDC port. After I had explored the P&E OSBMD/OSJTAG virtual serial port, I wondered if this works as well for my Freedom board. And yes, it does! So I used that opportunity as well to improve the FSShell component I’m using in other projects. The result is an application with FreeRTOS, a realtime clock, changing RGB LED and a Shell using the OpenSDA USB CDC for communication with the host. 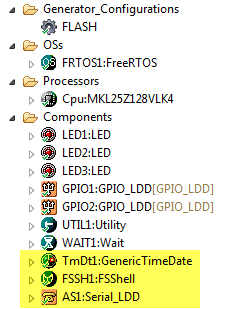 GenericTimeDate: A generic real-time clock implementation, see There is a Time and Date for both Worlds. FSShell: A file system shell with command line interface. See FatFs with Kinetis. Serial_LDD: Logical Device Driver for a serial/UART connection. Additionally I have added a new routine ReadAndParseLine() an ‘append’ buffer management. This is useful if the terminal is sending character by character (and not as a full string). It turned out that this was a good idea if using Tera Term. **         line will be parsed. **                           zero byte at the beginning. **                           the user application to parse user commands. **                           If not used, NULL can be passed. Trying my application did work right away: both the Eclipse Terminal view and Termite had problems: the were blocking after few seconds :-(. Not sure if this a generic problem of the terminal implementation or the OpenSDA USB CDC implementation. Luckily it worked perfectly with Tera Term :-). So that’s why I’m showing Tera Term screenshots below. This shows me as well all RTOS tasks with their status, along with performance information about each task. The project and sources can be downloaded from this link. The Freedom has no physical UART/RS-232 on-board, but this is not a problem for me any more as I have a working shell connection through the P&E OpenSDA USB CDC connection. Although the OpenSDA firmware on the board is preliminary, it works very well. 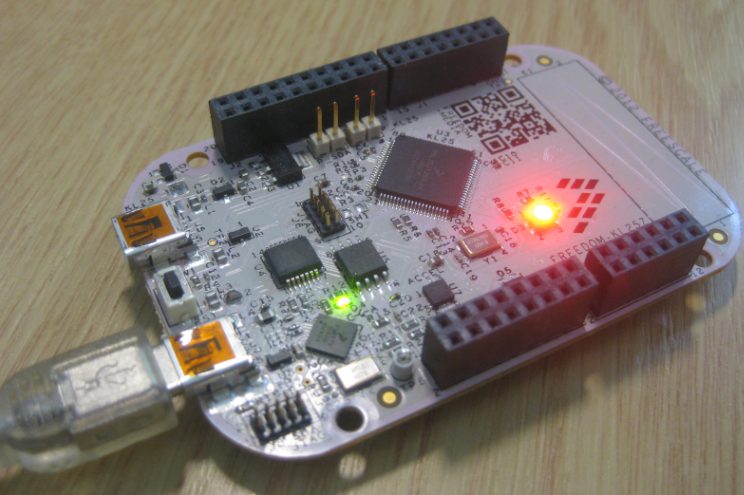 And I was able to successfully extend my Freedom board application with a real-time clock and a shell. This entry was posted in Boards, Debugging, Embedded, Embedded Components, FreeRTOS, Kinetis, KL25Z Freedom Board, Processor Expert, USB and tagged Debugging, Embedded Component, FreeRTOS, KL25Z Freedom Board, P&E, Processor Expert by Erich Styger. Bookmark the permalink. Please help me with this task: how can I create and parse my own command to the shell? The Sources\Trace.c implements its own parser. This parser is listed in the table present in Shell.c. Can you explain the diffs between FSShell and CLS shell? The ‘FSShell’ is the old/legacy one: it started as a ‘File System Shell’ for FatFS. As such, it incorporates functions like ‘dir’ or ‘print file’. 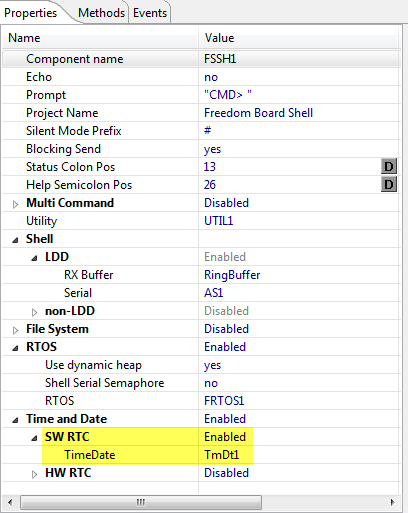 Later functions for FreeRTOS like showing the tasks/etc had been added. So it was more than just the shell core, it had functions of other components in it. Which was not good from an architecture point of view. And it created issues with recursive includes. So I re-factored that component as ‘Shell’, and with only the command line shell core. And the command line features of FreeRTOS has been moved to the FreeRTOS component, and the command line shell functions for the FatFS to the FatFS component, and so on. That way every component can offer a command line interface, and the Shell component just provides the services (like parsing, using command callback tables) and so on. so for new projects we should probably use the new shell (CLS)? …the one thing about the old one which stuck out is it appeared (though I could be wrong) that you could simultaneously have a USB_CDC virtual serial port and a real UART serial port, which could be very handy sometimes. Yes, you should use the Shell (CLS) which is much better. And no issue with using it in paralle with USB CDC, SCI. I’m right now using it with Bluetooth, SCI and USB CDC plus a nRF24L01+ connection. You only have to specify the default connection, but you can add any other connection to it (not in the component itself, but just with another I/O structure). I believe I have posted an example of this, otherwise I can post something. It is used in my robots, and features SCI, Bluetooth, I2C and IEEE802.15.4. Initially when I try your SSHell component it did not work. instead a RingBuffer. SShell was not seeing the RingBuffer for some reason. I was then able to get the SShell working. Do you mean the FSShell or the Shell? Do you have any tutorial explaining how to use the shell component in more details? Unfortunately, I could not understand which are the types involved in operations such as CLS1_StdIO_OutErr_FctType, and how the boots are made! I was hoping that the sources are self-explanatory ;-). I don’t have a dedicated turorial about what you are asking for. The CLS1_StdIO types are structs with function pointers. And the function pointers are pointing to functions to read/write characters. Seeing the sources, I could understand! Thanks! 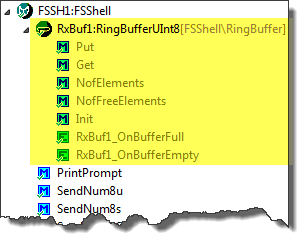 Can you change the interrupt handler to ‘own for every’ so you know which interrupt has fired? I really want to thank you for all the info and examples that you post, I’ve learned more reading your blog than in some of my classes at the University. I have a question about the stack size needed by a task on freeRTOS and the info gived by the rtos status on the shell component (CLS). I’m running 3 tasks: mainTask, shellTask, IDLE. All using the minimal stack size. If I sum the stack used by the 3 tasks and the free heap it makes 8764 bytes, a lot minor that the 10500 defined in Total Heap Size. So, I don’t understand why. 1. In what units is showed the task stack in the rtos status with the shell? 2. In what units are the stack size parameter that we put in the task create function?, Are the same units of the config RTOS parameter: Minimal Stack size? many thanks for your nice words, appreciated :-). >>1. 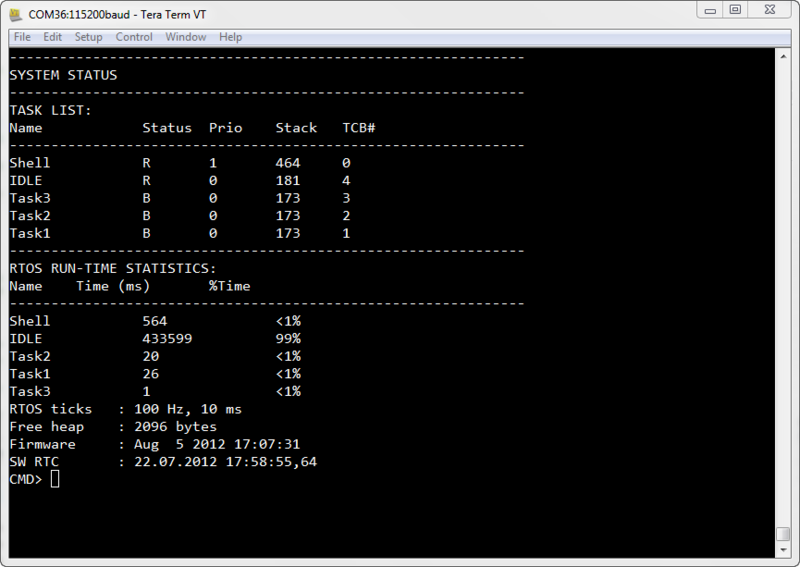 In what units is showed the task stack in the rtos status with the shell? It is in ‘stack units’, to be more precise of type portSTACK_TYPE which is 32bit for ARM. Or ‘stack addressable aligned units’. >>2. In what units are the stack size parameter that we put in the task create function?, Are the same units of the config RTOS parameter: Minimal Stack size? Same as above, it is in portSTACK_TYPE or stack units. 32bit (4 bytes) for ARM. I recommend that you allocate enough stack in the task creation call, then monitor usage of stack with the shell, and reduce if feasible. Just one thing to keep in mind: the shell reports ‘number of free stack units’, so if this number goes low (say below 50), you probably better allocate more stack space for the task. Keep in mind that interrupts run on top of each task stack. And yes: heap size is in bytes, default stack size is in ‘stack units’ (32bit for ARM). (100 stack units by task)x(4 bytes by stack unit)x(3 tasks) + (8620 bytes of free heap reported by shell) = 9820 bytes. But the heap size configured on the RTOS is 10500 bytes. Is the RTOS consuming 680 bytes of its own heap? And another small question: The size code info given by the compiler says that the RAM consuming is about 11KB, and the KL25Z has 16KB. But if I put more than 10500 bytes of heap for the RTOS, for example 13000 bytes, the compiler shows the error: “region m_data overflowed by 1576 bytes”. Do you have any idea why? Could you post the total size of the code in RAM and in FLASH that this shell is consuming with and without the RTOS? And thanks for having this blog and sharing all that info, its a huge huge huge help for the freescale kinetis users! the size of the shell depends on the amount of features you enable, and it would depend what you measure (including the UART drivers or not)? Thanks a lot, It works fine! I’m trying to use the Shell component of processor expert with a k40 microcontroller and some components don’t support this. Do you have any suggestion about how to adapt this component or how to create a new component compatible with this microcontrollers? Can you provide details what you mean with “some components don’t support this”? KDS says that the mk40dn512vlq microcontroller does not supports AsynchroSerial component and any _LDD devices. Have you created the project for the MK40DN512 only with Processor Expert enabled (but no SDK selected)? Then you can use LDD and other components. But if you create the project with an SDK enabled, the SDK does not support this. It is exactly what I needed! Thank you very much for the attention. And congratulations your blog!